Hello Dolls, anyone here knows the exact details of Women’s Day here? I personally don’t have real faith on ideas like on women’s day we deserve special treatment and on men’s day men deserve that.My idea of Woman’s Day is celebrating woman hood.I am a proud bong that loves wearing saree. I always nurtured an idea that Saree should be the initial step for celebration of this day.My immense love for saree started growing day by day.But this is India dolls, the bollywood fan’s should know that every cheesy bonding is followed by a villain here. Between Me and my beloved Saree came Mr.Comfort .A desperate wanna be of mine that always created a distance between saree and me.Drapping saree so far was like always looking for mom because I was disastrous in doing it.After attending a Blogger’s Meet and Saree drapping worshop with Ms.Dolly Jain conducted by Triveni Sarees my nightmare of drapping exists no longer.I must say if not a specialist in drapping saree am not even bad these days. 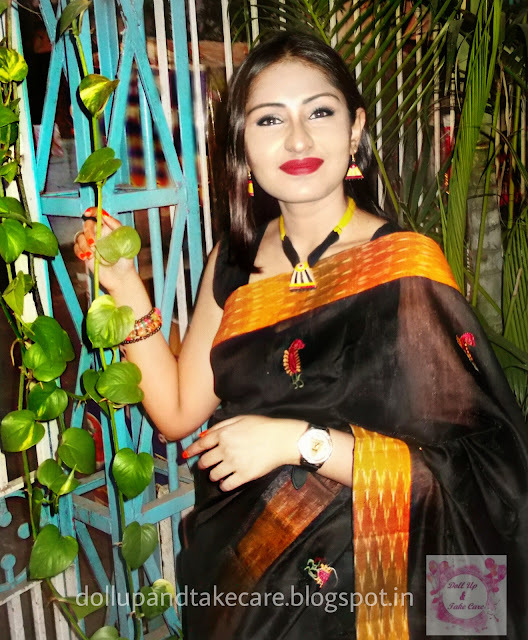 Ms. Dolly Jain’s taught us some tips and tricks about drapping a saree ,I mentioned in a previous blog about that event conducted by Triveni Sarees at Oxford Book storeKolkata. The growing globalization has wiped off several distinctive features around the planet.But one can still get a fair idea of where they belong , just by looking at the dressing style of the angel god left on earth ,so that you never miss his presence.All of us called her "Maa" ,she is the one who silently conveys a message to you that ethnic wear is the pride of Every woman.This Women's Day I have decided to celebrate Woman-hood with bengal’s signature costume “Saree”.Trivenisarees.com is here to tell you Ethnic wear reflects the tradition, the culture of a nation, of an entire civilization.I am a proud bong who loves flaunting saree. Triveni comes from the diamond capital of India.As we all know ,All great things start with a move.,in 1985, Mr Giridhar Sarraf moved to Surat, the rapidly growing textile hub of India, to setup Sakambari Silk Mills. Sakambari manufactured synthetic sarees under the brand name “Triveni Sarees”. In 2011, the journey of TriveniSarees.com – to take the fabulous Triveni collection worldwide, online and a few clicks away. Triveni started directly interacting with their customers – they listened to customers, added Salwar Suits, Lehenga Cholis, Lehenga Sarees, Kurtis, Jewellery, Cotton and Silk Sarees to their collection. Triveni became Triveni Ethnics.Kolkata’s bloggers were invited to their bloggers meet by the Second generation of Sarraf family Mr. Arvind Saraf..The workshop with Ms.Dolly Jain inspired me to choose this saree from Triveni and flaunt it. Sharing a few glimpse of my Women’s Day Special look .This beautiful saree is from Triveni Ethnics .This fabulous cotton fabric is very comfy and easy to carry .Cotton is my summer favourite I must say. 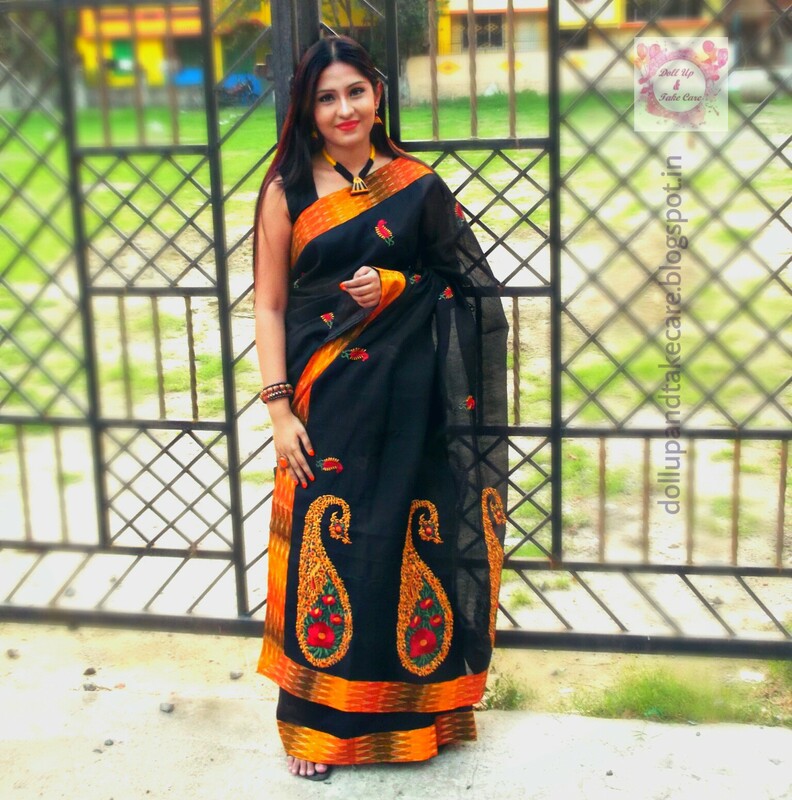 I love the beautiful kotki border that adds immense grace to the saree . 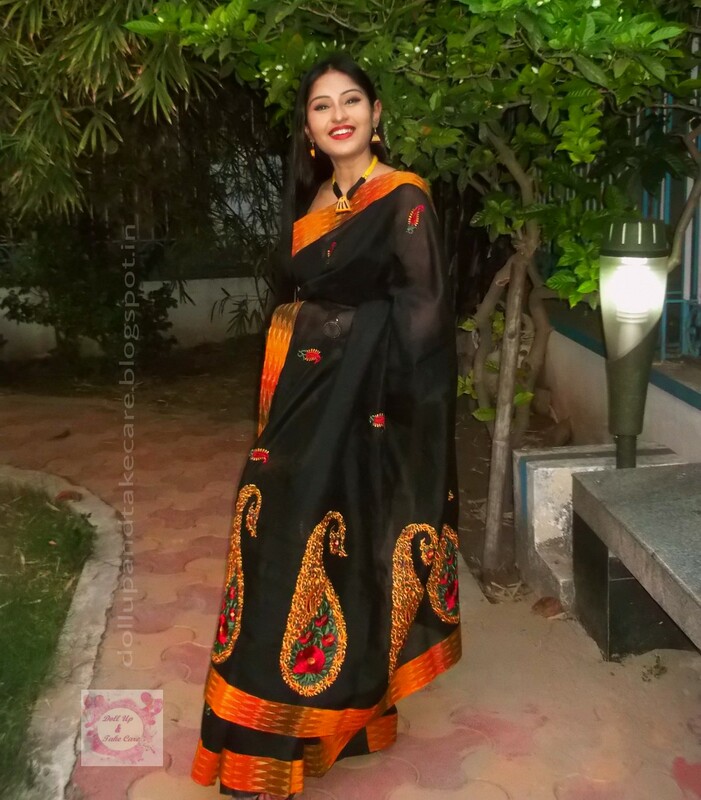 Triveni calls it “Charing black colored embroided cotton blend saree” . This fabric is a comfy cotton blend and the style of fabric used in the vorder is mostly popular in odisha. 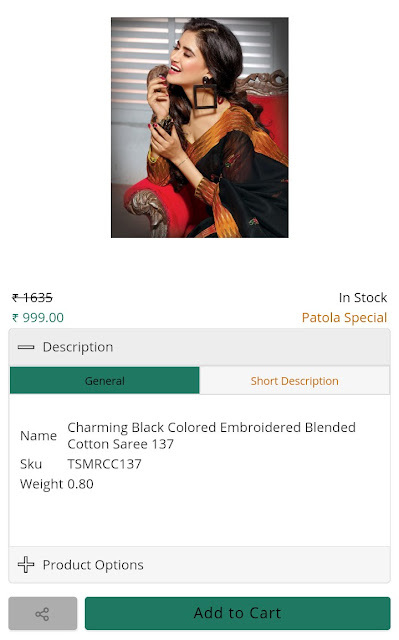 I was surprised to see this beautiful blend.Firstly cotton blend fabric , kotki border adds a bit of bong intellectual charm to this saree ,adding to that the marvelolous embroidery skill deserves some praise.The best part ,it looks exactly same as it appears it nthe website/app's photo. 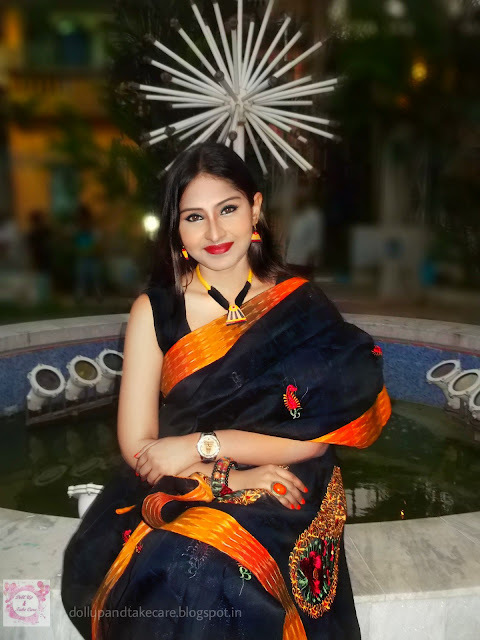 I have styled styled this saree with matching accessories that I have baught from Gariahat .I am not really an expert in buying accessories to match with saree.I guess I have shared my painful saree crave story before .Thus it justifies enough of my skill of being novice to choosing accessories for Saree. .Luckily I was able to spot this beautiful set.I can relate spring always with Butea(Palash Flower) .So I decided to paint my nails with the fiery orange shade from Seduction Las Vegas . So , this Women’s Day am the happy bong that knows how to drape a saree in proper manner and carry it with utter comfort . I really have no words to thank Triveni Ethnics for this saree and mostly for the workshop session with Ms. Dolly Jain . You know what some I have some interesting gossip in my kitty as well. Me ,Saree and Mr.Comfort are friends now. Whats Your Women’s Day Plan ? Do share with me .